Laserfiche Workflow has over 60 activities that let you automate everything from updating databases to creating Outlook calendar events. However, one of the most powerful activities is also the most common: Route Entry to Folder. Once you’re comfortable configuring this activity, you’ll have the backbone of a lot of your workflows covered! This activity performs one of the most common business process actions—moving documents among folders—and it also assigns metadata, sends emails, and tells the workflow to wait until a condition is met. The functionality described in the example below is accomplished all with this one activity. Example: Project Proposals need to be routed to the Department Manager for review. A Route Entry to Folder activity automatically puts a shortcut to the project proposal in the Department Manager’s folder. (The original stays in the folder of the team that is proposing the project.) It then puts the current date and time in the “Sent to manager on” field and applies the “Needs Review” tag. Next the activity sends the manager an email alerting her that there’s a project proposal for her to review. 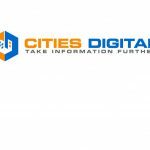 It also attaches a shortcut to the proposal for easy access. If the manager doesn’t review the project in three business days, a follow up email will be sent to remind her to review the proposal. Once the manager removes the “Needs Review” tag, the shortcut is removed from her folder, and the workflow continues. Drag the Route Entry to Folder activity to the workflow canvas and double-click it. In the Destination tab, specify the manager’s folder. Tip: To make this path dynamic, use tokens. In the Action tab, select Creating a shortcut to it and select the checkbox below this option to remove the shortcut from the manager’s folder after the review is done. This option ensures that folders don’t get cluttered with automatically generated shortcuts. 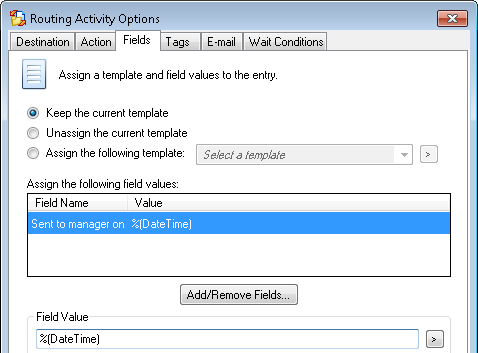 In the Fields tab, click Add/Remove Fields and select the “Sent to manager on” field. Click the token button next to the field, point to Global, and select DateTime. In the Tags tab, assign the “Needs Review” tag. In the Email tab, click Add and configure an email that alerts the manager that a project proposal needs her review. 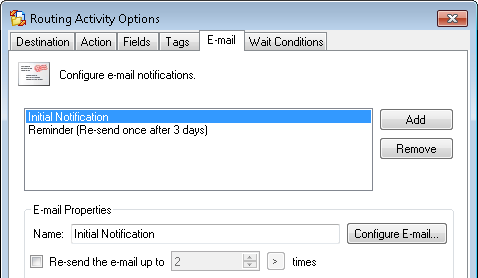 Click the Add button again and select the Resend the e-mail up to checkbox to configure an additional email that will be sent at the specified time interval if the manager has not reviewed the proposal by that time. In the Wait Condition tab, create a condition so the activity will wait until the “Needs Review” tag is removed before continuing.